Because it is reliable, intelligent and quick! ACE – Acupuncture Expert, unique in the field of acupuncture software, can help practitioners have a better understanding and work more effectively. Why? Because ACE will produce a detailed data and professional guidance for almost any possible scenario. Inside ACE, you will find the traditional information like other acupuncture software, along with newer computerized systems. Unlike other tools in the market, it is not just an electronic book! The inner database includes vast information on Chinese medicine, both from Chinese and western viewpoints. The data is not static and has dynamic inner connections. This database includes thousands of symptoms, hundreds of herbal formulas, hundreds of special acu-point combinations and hundreds of Chinese herbs. It also includes all of the body points, ear points, extra points and their charts; and a list of Western diseases and information, Chinese syndromes. 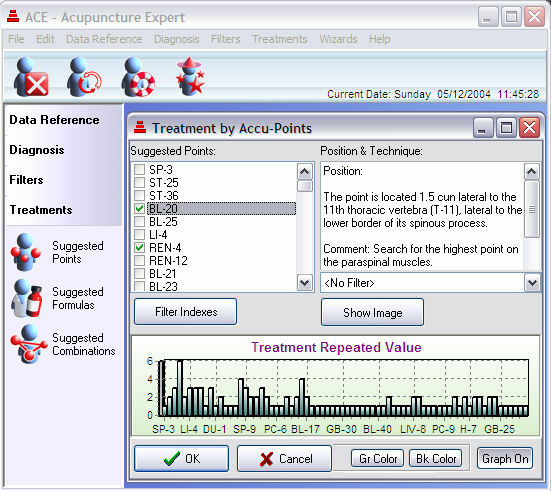 When a practitioner is using acupuncture software like ACE, he or she will most probably use it for much more than just a database software program. This is due to the unique structure and advanced tools it contains. ACE includes exceptionally smart wizards and unique filters that enable the practitioner to analyze and easily manage every situation. The practitioner can obtain the information, and then use the smart wizards and special filters, which serve as an intelligent means of providing ideas and help at every stage. ACE provides both diagnostic and treatment assistance. You may also want to check the section on chrono acupuncture. ACE will actually monitor your work and inform, suggest, and advise. It will be like getting an extra professional guidance, or just as if consulting with other colleagues. This is why EVERYONE can use this tool for their work and studies!